Notepad Corner: Cheers for the School Year’s good start! Cheers for the School Year’s good start! Moving to a new school to start the high school level is exciting yet at the same time brings many thoughts racing to our kid’s head – fear about the new school policies and teaching procedures, worries in making new friends and conforming to their social norm, nervous in riding the new school bus service and the feeling of being a total stranger in a whole new environment. This is one decision that needs a serious talk between the parent and child because transferring to a new school means adjustments and adaptation. We need to make them understand the reasons behind why they need to transfer to a new school. In a short span of time, they can adjust and adapt to their new academic environment by motivating them to relax, smile, be nice to everyone and don’t be shy. Yahmir, my youngest son has entered the junior high school life being a grade 7 this school year on a new school. We did not have a hard time convincing him to move to a new school, although normally he’s anxious in the beginning, but after two weeks of attending his classes he started to feel comfortable and begin to like his new school more. He gained new friends and is always excited to go to school. Lately, he was very happy to have chosen as one of the class representatives to join the dance competition; their group won which made him a lot happier. Dancing is one of his passions and interests, although it is important to focus more on academic studies, extracurricular activities such as talent competitions can help balance and condition the student’s mind. Sharpening child’s skills is as important as learning and gaining more knowledge and wisdom. 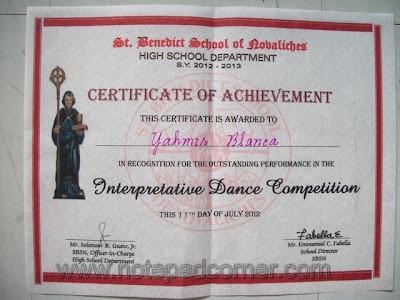 in recognition for his outstanding performance in the Interpretative Dance Competition last July 11,2012. It is indeed a good start to motivate him more to do well not only oh his dancing ability but also encourages him to exert more effort to study to strive for more awards. I am very glad that Yahmir is now happy Benedictine, Cheers! Congrats to Yahmir and also to the proud mom!